I’ve been writing for a while now and that means a lot of editing, and I mean A. LOT! It’s important to edit, edit, edit before you even think about submitting to a publisher and even if your book is accepted, it’s likely you’ll face even more edits, this time with the guidance of your agent or editor. I think learning to self-edit is one of the hardest skills to acquire. Joining a writing group can help because you learn to look at other people’s work objectively and can then apply these skills to your own. It also helps you be more critical. But even then, there will come a time when you have to look at your manuscript on your own, so how do you tackle this? Here are my top five tips. It’s been said that it’s better to have a rubbish first draft than a blank page. You can’t edit a blank page. But, when it comes to editing, one of the first things I do is to ask myself if my first draft is ready to enter the editing stage. A lot of the time my answer will be no. Now what I do is when I’ve finished my first draft, which is all about getting words on the page and the basics of the story told, I do a re-draft. I don’t think of this as editing because it’s not polishing my work, it’s literally tearing it apart. Re-drafting means fixing the basics of the book in terms of its structure and identifying plot holes. Once you’ve done this and moved sections around or added in first drafts of new scenes and chapters, you’ll be in a better position to begin that first edit. Before you dive straight in though, put the manuscript aside for a while. Having some distance from the project means you’ll be able to read it more objectively, as if it belonged to someone else. A piece of work will likely go through many edits before you’re happy with it and it’s definitely worth having some time between each edit if you can. Once you’ve read a piece of work through six or seven times in succession it’s difficult to remember where you are, and when you notice repetition you won’t be able to see if it’s because you used that exact phrase three chapters ago, or because you’ve read it so many times already! I think one of the best things to do is to edit in stages, looking for certain things. Once I’ve re-drafted and made sure I’m happy with the structure of the book, I edit for certain things – plot holes, character arcs, setting and atmosphere, and finally line edits, which involves looking at spelling, punctuation and grammar, and word choice. By tackling one or two aspects at a time it feels manageable and it’s easier to stay focussed. We all have them! My particular ones are that I use certain words a lot. That, had, looked and walked are my weaknesses. When I’ve tackled the big things and I’m down to line edits I pay particular attention to these things. If spelling, punctuation and grammar are your weaknesses focus on this in one particular edit towards the end of your process. Whatever your weakness is, knowing it and taking the time to dedicate an edit to this will really help you polish your work ready for submission. Some people hate adverbs, some people love them. I love a good adverb, particularly in dialogue, but too many can slow the pace of your writing. Whilst you don’t want to lose your narrative voice, there are times when a strong verb is better than an adverb. For example, instead of describing someone as talking quietly, they could whisper or mumble. This is actually a better description for the reader. Instead of having someone walk quickly, have them run, jog, race or stride. Do you see? Sometimes an adverb is good, sometimes a strong verb is better. It’s for you to decide what fits your writing, but try and think as a reader and what will give them the better description of what your character is thinking or doing. There’s so much advice on the internet about self-editing that these tips are just the tip of the iceberg. A lot of it is about finding the process that suits you and refining that process the more you write. It’s not easy, but it is fun knowing that at the end of it, that rough, crazy first draft will have been polished into something more refined and elegant. 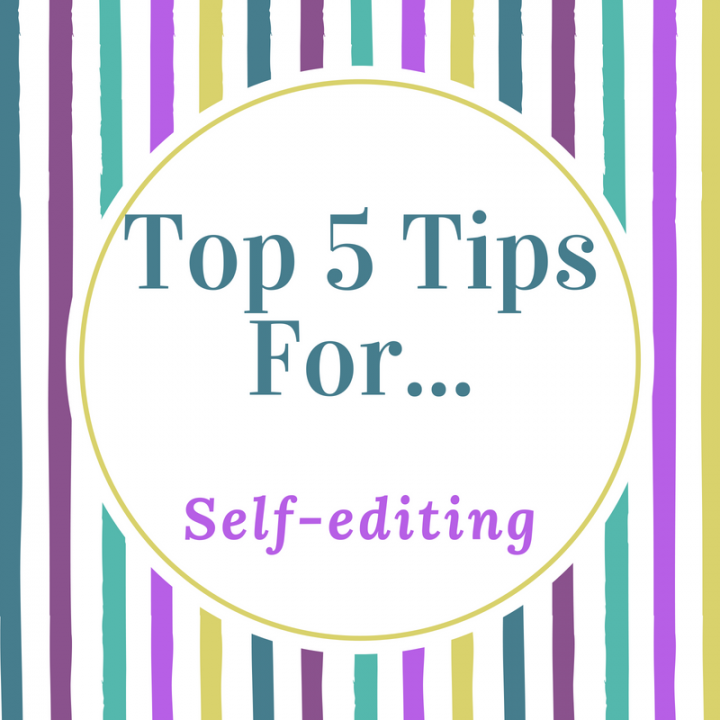 So what are your tips for self-editing? Are there any different ones in your top 5’s?